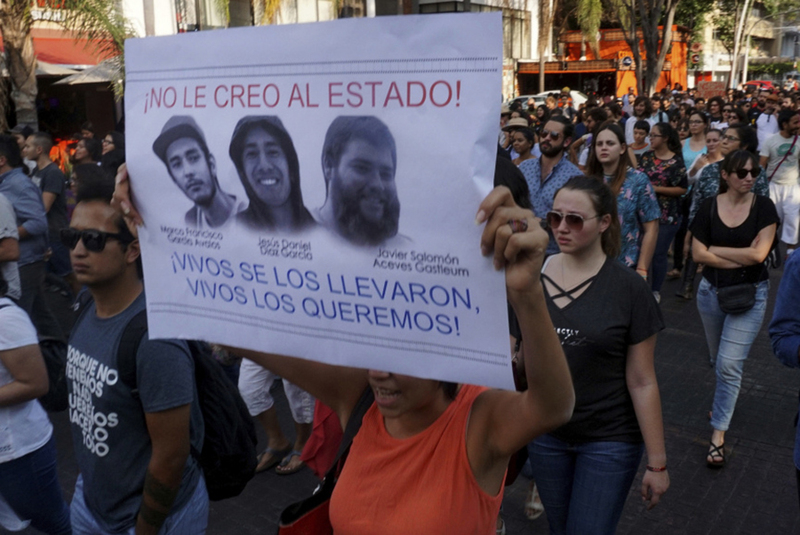 Three Guadalajara film students were kidnapped, beaten and killed. Their bodies were then dissolved in acid, thus causing an outrage on Tuesday across Mexico and on social media. The disappearances of people, according to the Mexicans themselves, has become a regular occurrence in the country where homicides were already setting a record number. The people filled the internet with denunciations of violence and impunity, which have taken over Mexico since decades. Even while the Hispanic country has been the location of countless kidnappings, massacres, and slayings, this particular case involving the three film students has touched the nation in the very deepest of their hearts. 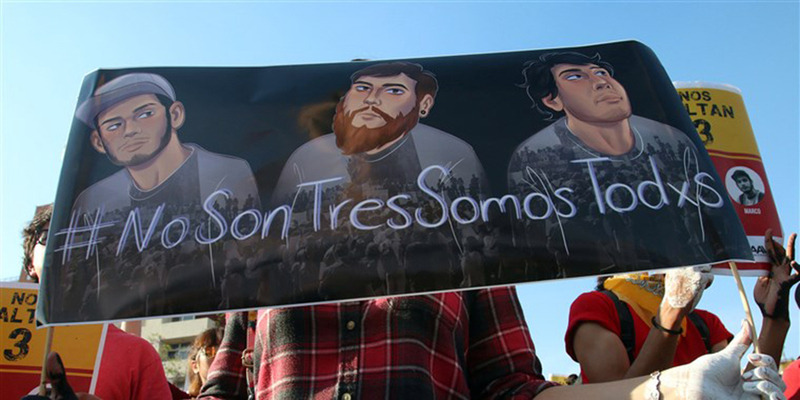 Salomon, Marco, and Daniel – the three victims – have become the image of a lost youth, and also the emblem of the crisis of Mexico. Politicians, police chiefs, and generals are being criticized considering the significance of the issue and their poor working. Guillermo del Toro, the Guadalajara-native, Oscar-winning director, who has been a leader for the young Mexican filmmakers, also raised his voice and gave his opinion on the matter. “Words are not enough to understand the dimension of this madness. Three students are killed and dissolved in acid. The ‘why’ is unthinkable, the ‘how’ is terrifying,” Mr. Del Toro tweeted. The journalist Luis Pablo Beaugard wrote a column right after the news of the deaths were released. He expressed his concern about Mexicans killing each other in a damaged political system. The journalist claimed that his country needed to attend with urgency, again, the chaos that is consuming the youth of their society. The actor Gael García Bernal, following the same line, stated that it is time for that horrific nightmare to end. Jose Merino, a political analyst, claimed angrily that to be young in Mexico implied that if you were at the wrong place in the wrong time, the smallest mistake in your behavior could imply tortures, death, and dissolution in acid. Luis Gerardo Mendez, another actor, added that he could not describe his anger and pain, and that he was shocked to how much life quality had devalued in Mexico. 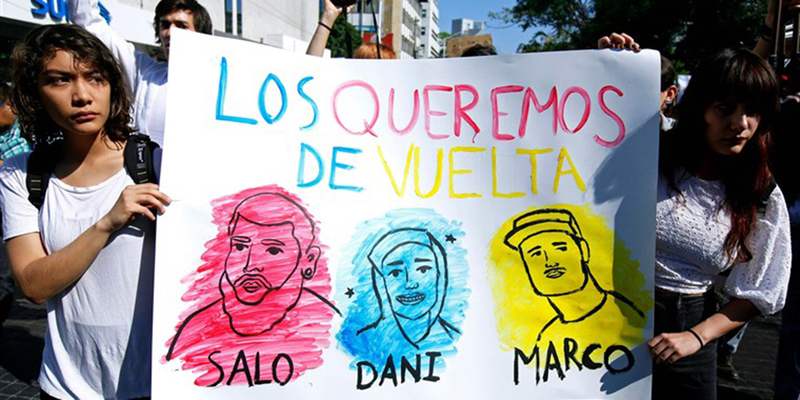 In social media, people have decided to start a movement in which they use the hashtags #NoSomosTresSomosTodos – which means “we are not three, we are all.” The users also have started commemorating the students with the hashtag #SalomonMarcoyDaniel, the names of the three students. They are also demanding answers from higher figures of authorities. According to the law enforcement authorities, the three aspiring filmmakers were kidnaped on March 19 in a Guadalajara suburb while they were doing schoolwork. They were later beaten, tortured, and killed. Unfortunately, they were mistaken by a rival criminal gang that the abductors were expecting. The men who kidnapped the young adults were heavily armed and identified themselves as police officers. The house, in which the three students were doing their assignments, was under surveillance by the traffickers who were expecting the arrival of a rival gang member. The house was also listed under the name of an aunt of one of the students, according to the police. The aunt was arrested on charges of prostitution and money-laundering, right after the students were abducted. According to the police, she was allegedly acting as a front for an organized-crime figure. Jalisco prosecutors gave a televised news conference on Monday. They revealed the fate of the three students and their ages. Javier Salomon Aceves was 25 years old, he was the older of the group; Jesus Daniel Diaz and Marco Garcia Avalos were both 20 years old. They all attended the University of Audiovisual Media in Guadalajara. The only way the cops could discover the identities of the victims was through genetic evidence gathered at several scenes, which then were associated with the crime. The major candidates postulated for Mexico’s presidential election, where the winner is expected to take place on July 1, condemned the crime and offered condolences. The main campaign theme during this pre-election period has been how to stop Mexico’s rampaging violence. However, the Mexicans remain skeptical that having a new president will alter the fatal dynamic that has been around for years now. Large demonstrations in Guadalajara demanding the releasing of the students took place during a period where crime rose in Jalisco and other places of Mexico. As authorities confirmed the death of the three young men, people confirmed the dates of their marches to protest all around the country. They also called for the resignation of the Jalisco Governor, Aristoteles Sandoval, a member of the long-dominant Institutional Revolutionary Party of Mexico. Police officers claimed two suspects are being held, considering they were connected with the crime. Six others are being sought. They were all linked to the New Generation Jalisco Cartel, one of the most powerful criminal syndicates in Mexico.